Artichokes are here! Well, these green globes are available year round but they are at their peak during Spring and Fall. We received a half dozen Globe Artichokes from our friends at Melissa’s Produce. We immediately thought about steaming them and dipping the leaves in melted butter before scraping the flesh off with our teeth. With an ample supply, we decided to hold off on the melted butter (for now) and create a dish that is truly worthy of the luscious vegetable by pairing it with a decadent risotto. Risotto is just short grain rice that is cooked to a creamy consistency. The process can seem like a long one, but it’s just a matter of stirring in hot liquid incrementally and allowing the rice to absorb it slowly. Besides with one hand free, you can sip your wine and scrape off some artichoke flesh! Preparing artichokes can be downright intimidating, but it doesn’t need to be! The folks over at TheKitchn.com have a great how-to page on their website with exceptionally clear instructions. 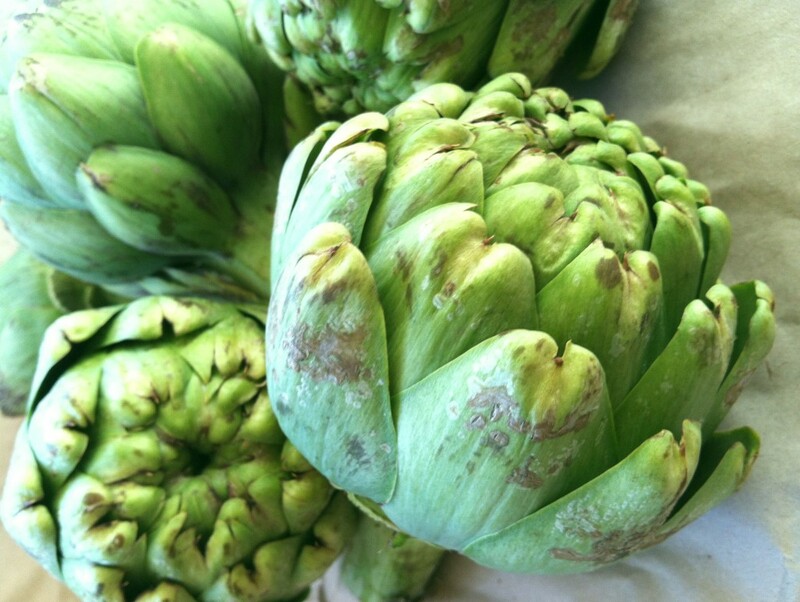 For some flesh-scraping goodness, simply boil or steam them and adjust the artichokes’ cooking time in the recipe. 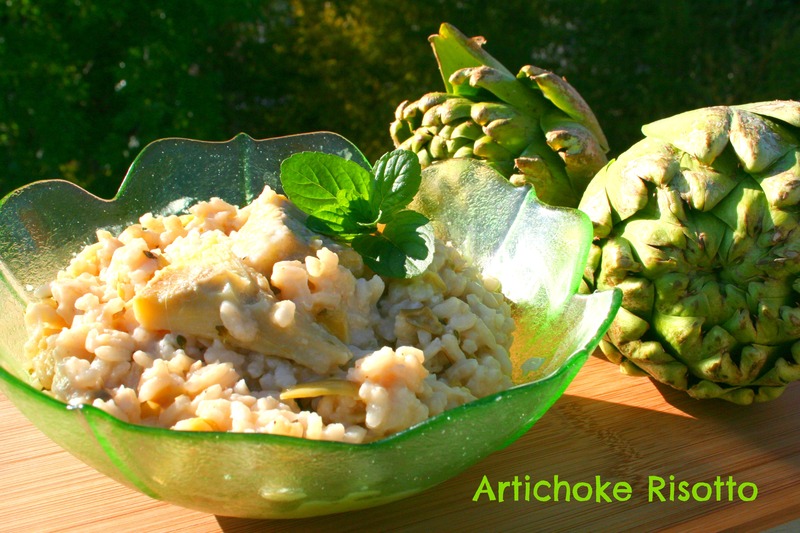 This Artichoke Risotto is decadent and creamy, and should be served immediately. If you manage to have leftovers, simply reheat on your stove by stirring in some hot chicken stock. *Note before starting: prep all your ingredients in the order listed before staring this recipe. When you get to the artichokes work quickly to rub the cut edges with the lemon slices and get them in the lemon water because they will begin to turn brown very quickly. In a sauce pot, combine the stock and the bay leaf. Bring to a boil over high heat and then quickly reduce to low heat and keep it at a simmer. In a large pot heat the butter with the oil over medium heat. Add the onion, garlic, and salt. Stirring occasionally with a wooden spoon until the onion begins to soften, about 5 minutes. Adjust the heat if you see the garlic browning. Add the prepared artichokes to the pan, stirring often until the artichokes are tender, about 12 minutes. Add the rice. Stir until the rice is evenly coated, ab out 1 minute. Pour in the wine, stirring occasionally. Cook until the wine is almost gone, about 3 minutes. Ladle in the stock a little at a time, stirring constantly until the liquid is almost all absorbed. Repeat this process until all the stock is used. The rice should be tender but still slightly firm in the middle. This process should take 18-22 minutes. Make sure to remove the bay leaf. Stir in the thyme, seasonings,lemon juice and zest. Stir in the mascarpone until it is just melted.